Now looking to narrow the gap between 33389 and 63326. Looks like this is number 13798 ? Or maybe 12798 ? I just thought it might reinforce the existing list whilst we look for the more important 'gap' ones. This would (I think) have been a very interesting addition - number 38971. It seems to have been a blue 102.
and the item isn't anywhere on the web site as far as I can see. 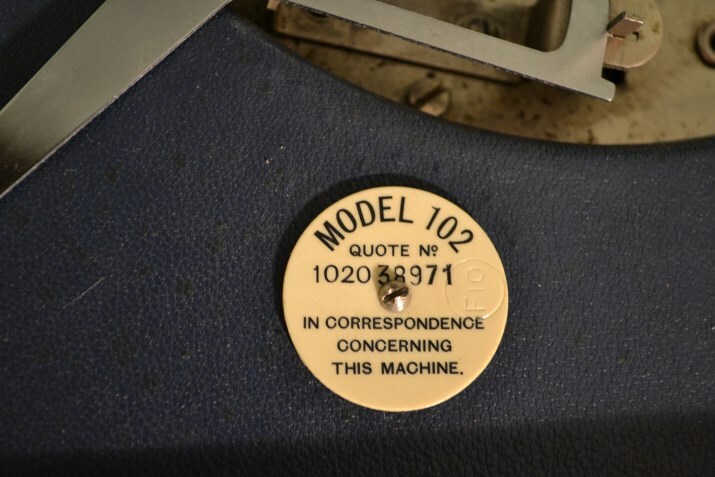 So, it seems that we know it was a blue HMV 102 but not which specific model of 102 it is. Unless someone telephones regent antiques to see if they remember or have archived photos etc. Oh, I wonder what 'F10' (circled) means on the disc ? Oh, if you input 'regent antiques blue hmv 102 gramophone' into the DuckDuckGo search engine there are a number of blue 102's from this antique site. The photo two away from the disc photo looks like the following (auto.jpg) so maybe it is not the early automatic break model ? Or are the photo's both later models ? Or maybe the disc and these photos are three different machines ? The last picture above is of a 102A with the later automatic brake, but still with the metal motor board. The clue is that the "On-Off Auto Brake" plate is secured to the motor board by rivets rather than by wood screws. Great advice - thanks epigramophone.